Description: OpenSS7 Project Status Transport. These projects are for components of the OpenSS7 INET stack. Each component is tracked under a separate project. Click on any of the components in the diagram or list below to see project information relating to the desired component. The SCTP project is to provide a Stream Control Transmission Protocol (SCTP) STREAMS multiplexing driver which will provide SCTP protocol modules. In addition, this project is responsible for a Linux Native implementation of SCTP and STREAMS access to the Linux Native implementation. OpenSS7 has two Stream Control Transmission Protocol (SCTP) drivers: one for the LiS STREAMS stack which is written as a STREAMS driver; another native to the Linux kernel. OpenSS7 provides an INET package for LiS STREAMS which provides a STREAMS Transport Provider Interface (TPI) to our Linux native kernel (sockets) implementation, as well as providing an SCTP STREAMS driver which provides Transport Provider Interface (TPI) and Network Provider Interface (NPI) under STREAMS. The TCP project is to provide a Transmission Control Protocol (TCP) multiplexing driver which will provide Transport Provider Interface (TPI) to the native Linux NET4 TCP implementation. OpenSS7 provides the strinet package which has been included in LiS STREAMS which provides Transport Provider Interface (TPI) to the TCP sockets implementation native to Linux. The UDP project is to provide a User Datagram Protocol (UDP) multiplexing driver which will provide Transport Provider Interface (TPI) to the native Linux NET4 TCP implementation. OpenSS7 provides the strinet package which has been included in LiS STREAMS which provides Transport Provider Interface (TPI) to the UDP sockets implementation native to Linux. 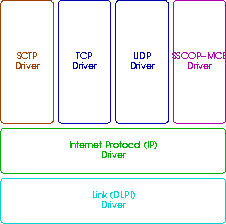 The SSCOP-MCE project is to provide a Service-Specific Connection Oriented Protoocl for Multi-Cast Environments (SSCOP-MCE) multiplexing driver which will provide Transport Provider Interface (TPI) and SSCOP-MCE protocol modules. OpenSS7 has also done some work of implementing a STREAMS version of SSCOP-MCE to round out the IP transport services of OpenSS7. The IP projects is to provide a Internet Protocol (IP) multiplexing driver which provides Transprt Provider Interface (TPI) to the native Linux NET4 IP implementation.